Inter-professional collaborations are invaluable relationships which can prevent the social exclusion of children and young people and are now a common feature of welfare policies worldwide. 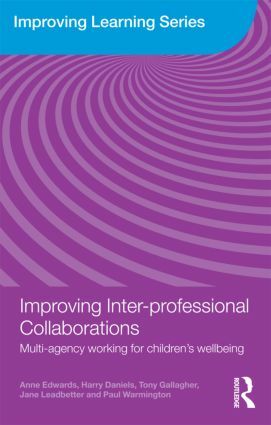 Full of ideas to help shape collaborative inter-professional practice this book shows that specialist expertise is distributed across local networks. The reader is encouraged to develop the capacity to recognise the expertise of others and to negotiate theor work with others. This book is essential reading for practitioners in education and educational psychology or social work, and offers crucial insights for local strategists and those involved in professional development work. The book also has a great deal to offer researchers working in the area of cultural historical activity theory (CHAT). The four year study was framed by CHAT and offers a well-worked example of how CHAT can be used to reveal sense-making in new practices and the organizational implications of enhanced professional decision-making. As well as being important contributors to the developing CHAT field, the five authors have worked in the area of social exclusion and professional learning for several years and have brought inter-disciplinary strengths to this account of inter-professional work. Anne Edwards is Professor of Educational Studies and Director of Research at Oxford University. Harry Daniels is Professor of Education at the University of Bath. Tony Gallagher is Professor of Education at Queen’s University, Belfast. Jane Leadbetter and Paul Warmington are Senior Lecturers in the School of Education at the University of Birmingham. The Improving Learning series showcases findings from projects within ESRC’s Teaching and Learning Research Programme (TLRP) – the UK’s largest ever coordinated educational research initiative. Each book is explicitly designed to support ‘evidence-informed’ decisions in educational practice and policy-making. In particular, they combine rigorous social and educational science with high awareness of the significance of the issues being researched.